This is a topic that we get a lot of calls about so I am going to tell your options and elaborate a little bit on each. There are pre-fab pool decks and there are custom built pool decks with pros and cons to both types, so hopefully this will clear up some questions that you may have. Let me first say we don’t sell or build any decks for backyards or swimming pools but we do put together pre-fab decks kits if someone needs one assembled. If you want a custom deck built we typically can send you to a reputable company that can do this for you. 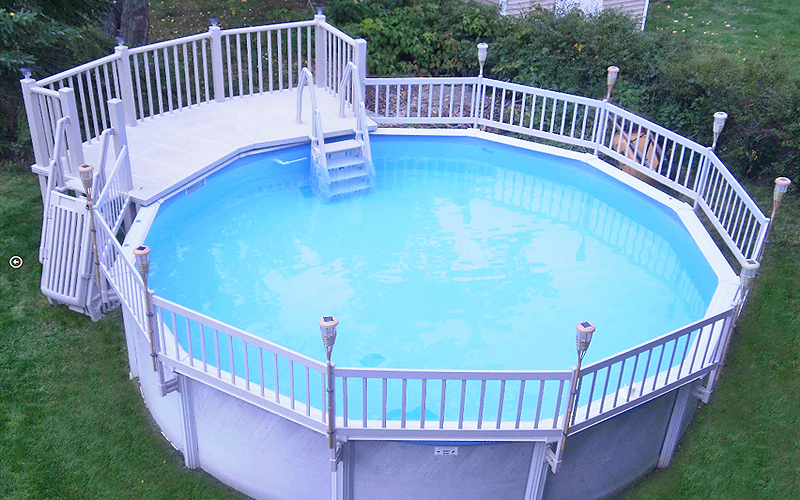 Above ground pool deck kits are available for most above ground pools but the selection and sizes are minimal at best. Most people that go this route choose the larger 5’x13′ curved deck kit shown in the images to the right. 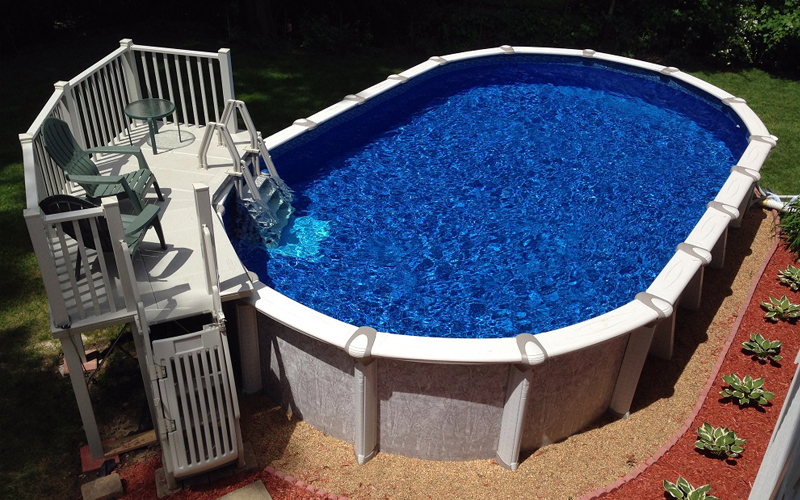 This unit works on 18′ round pools up to 33′ rounds as well as most mid to large sized oval pools. These decks have a heavy duty steel frame and finished with white or taupe vinyl fence material for the railing, floor and ladders. The pros here are safety ladders are included and it’s fairly easy to put together with basic hand tools. The 5’x13′ deck holds up to 1400 lbs which is more than you’ll need and fits pools of any height up to 54″. The 5’x13′ size deck isn’t huge but enough for a couple of chairs and a small table. The steps both up to the deck and down into the water are high quality and come with the kit. There is a smaller 5’x5′ square deck that can be used on any pool and come with the same step system. Both deck kits don’t actually connect to the pool and can be used on practically any model. You could sell or take it with you if you are moving or no longer need it. The cons are lack of configuration and price. What you see is the only way it comes, you cannot add to it or change it in any way. Some may think the price seems high but compare that to a custom deck build and it may not seem out of line. 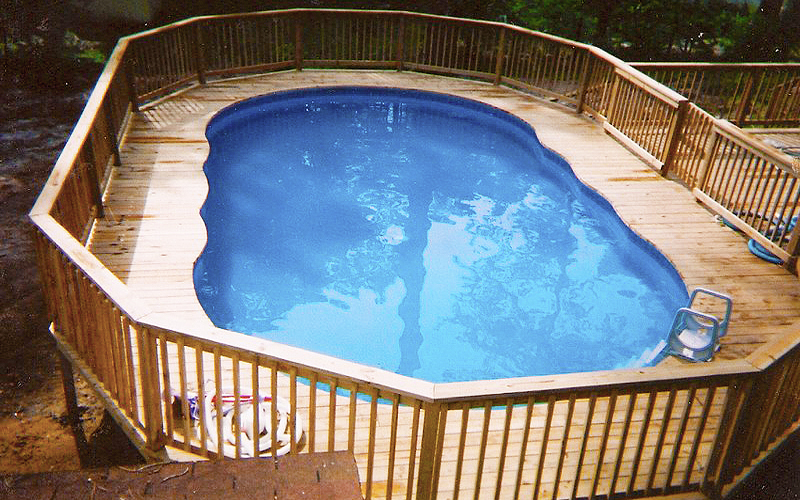 Custom pools decks are exactly as the name implies, custom built to your liking. Typically made from wood or composite material this is a permanent structure fixed to the ground. If going this route make sure to only use treated lumber and stainless steel or high grade fasteners for longevity. The pros are configuration, material choices and features as custom decks are limited only to your imagination and budget. Deck size, shape, color and feature elements are all up to you. Seating, benches, lighting are all common design elements that can be added when opting for a custom build. 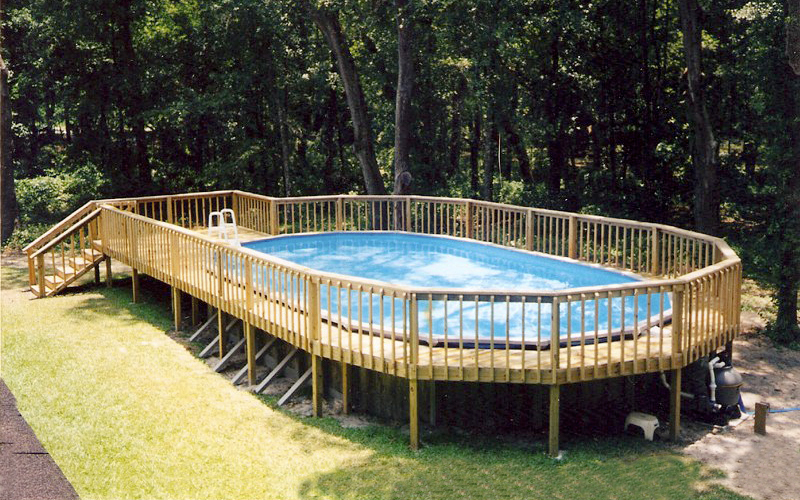 Wood decks are also a great choice for pools that are buried into the ground or on a hillside. Lastly, it’s really hard to beat the natural beauty of wood. Here are a few images of great work by Decks By Donny And Son in Marion County Florida. 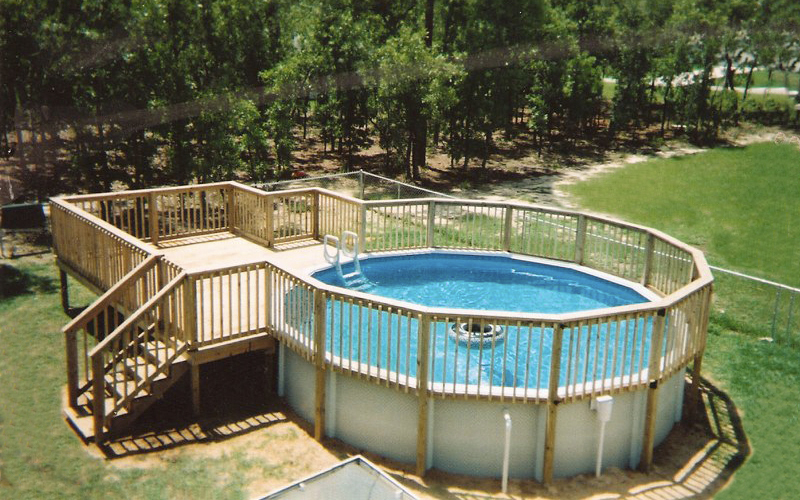 They have been building high quality pool decks for 30+ years and they only use the best materials available. If you live up their way and need a custom deck for your backyard give them a call. Click the images to the right or the link above to go directly to their website.